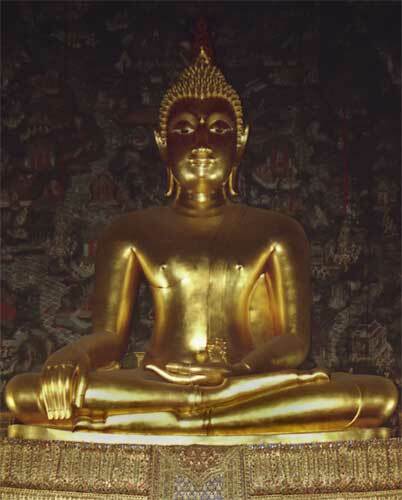 he Sukhothai Buddha image is unique when compared to other types of Buddhist sculpture and it is also part of an art movement that is still vital more than 700 years after its inception. Four of these sculptures are still in use and easy to find. The most well known is the Buddha image called Phra-putta-chinarat1 which resides at Wat Mahatat in Phitsanulok.2 Two walking Buddha statues3 have been placed near the back entrance to the Marble Temple in Bangkok (Wat Benjamabopit).4 And also in Bangkok, is a very large Royal image called Phra-sri-sakaya Munee,5 which resides in the main chapel6 of Wat Suthat temple. A closeup of the very famous Phraphuttachinarat shows a very high refinement in the creation of stylized facial features. It is important to spend enough time, when looking at these big statues, to be able to absorb the expression that radiates from them. They posses an obviously refined character, but the sense of pervasiveness may take some time to manifest. It’s a good idea to sit silently for some time in front of them. Just by looking, eventually, the elements of form and proportion will come together and yield an effect of rhythmic, outward radiance. The anonymous people who worked on Phrasrisakaya Munee for almost two centuries were nothing less than the greatest artists. The scale of the presiding Buddha image is really quite large. So it is easy to feel overwhelmed just by its immense size. Perhaps this is why most people don’t even seem to look at it for very long. The longer I look at it, the more the artistic elements in the sculpture begin to come together. Ultimately, it is one large, whole work of magnificent sculpture. Standing at ground level the sculpture Phrasrisakaya Munee towers above. The artistic elements of Phrasrisakaya Munee are unified. The proportion is very well balanced too. The head, shoulders, torso and legs are part of a body, which has a credible shape. At the same time, these parts work in concert to make a whole organic form. No one part obviously dominates another, which yields a harmonious balance. The over all look is unique. Buddha seems to be alive watching and participating with us. And he’s a giant who sits with us in the same room. Artistically, there are two types of line to consider when analyzing this antique work of art. Thai artists refer to this first line as san tang trong.7 This is the centerline that connects the top of the flame on Buddha’s head to the base. It is a line of symmetry. The balance between right and left is also symbolic of the Buddhist concept of the middle path. Never reaching for extremes, peace comes from balancing the opposing sides. This idea is implicitly reflected in the symmetry of the facial features. The second line to consider is the outline of the form. It is a dramatically curved contour. This line is a refinement of shape that is repeated as a motif in all aspect of the parts. 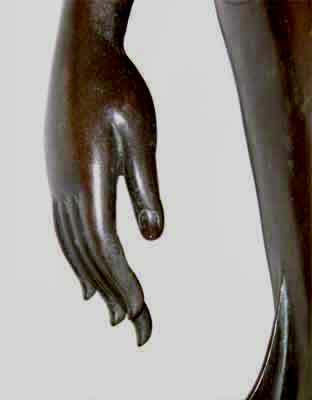 The facial features have dramatic lines in the lips and eyes, and the wrists have major curves that come down to form the fingers. The shoulders, arms, hands, legs and feet all have this swinging arched line.8 It is intended to represent the kindness and mercy of the Buddha, as well as the kindness that all Thais expect from each other. 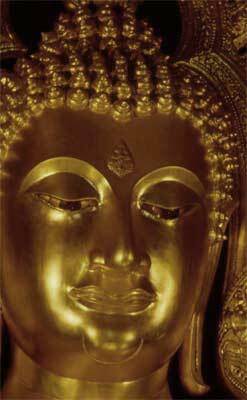 The Sukhothai Buddha image has a very beautiful mass especially in the volume of the face, chest, torso, and waist. The arms are intended to mimic the bulk in the trunk of an elephant. To see the distribution of mass you must steep back far enough from to view the entire sculpture at once. As the light falls upon it, you will be able to see the volume. The anatomy, quality of line, and massive scale mix together wonderfully. These are some of the qualities that made the Sukhothai artists different from the Sri Lankan school. These techniques were developed generation by generation until these elements came together in a new style. So much so, that no other Thai sculptural style is considered more beautiful than the Sukhothai style. Beautifully shaped hands with fingers of equal length. The Buddha’s right hand rests over the knee. 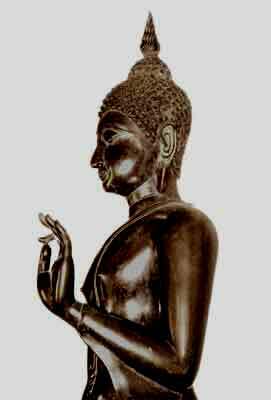 The Buddha’s two legs form a continuous mass from left to right. When a walking image, it has the sense of forward motion. Often times the English name for something is not a translation from the Thai but a separate name completely. he Sukhothai kingdom flourished, and was most likely started during the reign of king Ramkamhaeng the Great. This period in Thai history is documented as having an abundance of things economic, agrarian, cultural, governmental and religious. As these statues were made within a religious context, they represent the beliefs of this culture. This now extinct civilization must have had a connection between the cultural and phenomenal worlds, for in the art they left behind, one can only bask in the reflection of harmony that this society must have possessed. Phrasrisakaya Munee is now the presiding Buddha image at Wat Suthat Thep Vararam in Bangkok. Originally, it was made in the ancient, northern city of Sukhothai and resided at Wat Phrasriratana Mahatat. Much, much later, it was removed by king Rama the First2 and brought to the new, modern capital of Siam. This image was first commissioned during the Buddhist 19th century3 (approximately the 14th Christian century). 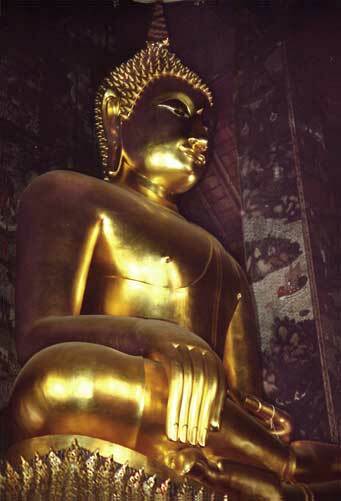 It was continuously worked upon and developed up through the 20th Thai century during the reign of king Li Thai. The grandson of king Ramkamhaeng, he was also keenly interested in spreading this unique version of Buddhism. Not only was doing this a way to overcome the Khmer4 leaders (who ruled with god-like authoritarian power), it was a way to better unite his expanding Sukhothai kingdom. Therefore, art and temples were commissioned in abundance. It is during the Reign of king Li Tai that artistic scholars mark as Sukhothai’s golden age. Works like Phrasrisakaya Munee reflect the feelings of the artists who made them. In this case, it is an ancient sense of holiness as peace. 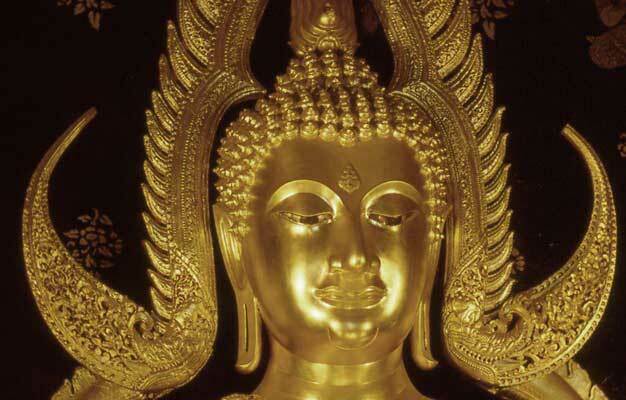 In the large statues above, the qualities of symmetry and pervasive beauty represent the character of the Lord Buddha. The expression on the face shows a fatherly look of compassion, someone who would give mercy towards all. The walking Buddha images give one the feeling of being lead down a heavenly path towards enlightenment. At the same time, these statues have what westerners would call a feminine character. The outline of the form makes for a truly graceful curve. And grace is definitely a quality of holiness. The height of classical sensibility for artists from the Sukhothai period was an emotion of peace and silence. In the presence of Phrasrisakaya Munee, exists a sense of a high and heavenly calmness even though immediately outside the temple is a noisy and chaotic world. Perhaps modern society is just too fierce to let the radiance of this image permeate farther than the temple walls that house it. Or perhaps the ancient society of Sukhothai was struggling against a noisy outside world too, until this giant sculpture spread peace out over the land. Four generations made and refined this work. And it is still radiating so many years later. Silence is golden. To the Thais this artistic style is one irrefutable piece of evidence that the people of Sukhothai were a happy and peace loving people.